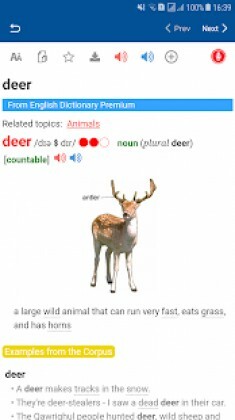 Premium Dictionary English is a Education android app made by English Study that you can install on your android devices an enjoy ! Premium Dictionary English is a complete vocabulary and grammar resource that will enhance your learning of English. Premium Dictionary of Contemporary English is the key to vocabulary building! Now with the full contents online, plus online Thesaurus and Vocabulary Checker. – 109,000 words, meanings and phrases, including words from the Academic Word List. – 59,000 example sentences, showing thousands of academic words and collocations. – Vocabulary of just 2,000 common words. – Words for content areas such as Science and Social Studies. – Collocation boxes show combination of words that are often used together, such as strong interest, highly successful, and take a test. 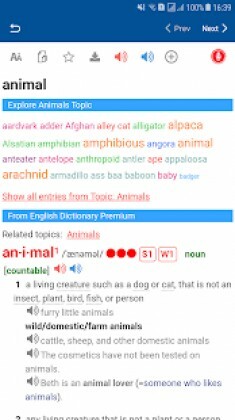 – Integrated Thesaurus explains thousands of synonyms and antonyms. -Learner’s Handbook on Writing, Collocations and Grammar. – Pronunciation of all the words and example sentences, and pronunciation practice. – Premium Vocabulary Checker: find out which type of vocabulary is used in the text you are reading and which words you should learn. – Thesaurus: choose the right word and build your vocabulary. – Topic Vocabulary: find all the words you need to write about common topics such as Describing Places, Technology, Sports and Relationships. – Academic Study Center with interactive exercises for vocabulary, reading and writing, and exam practice for TOEFL. 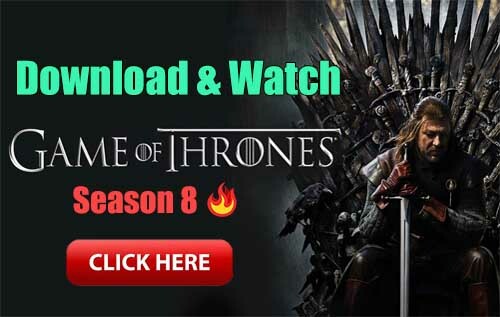 ● Definitions written using a vocabulary of just 2,000 words – the King Defining Vocabulary, ensuring all definitions are clear and easy to understand. ● Frequency information on the most common words – the new King Communication 9000 – helps you learn them first. All this makes the Premium Dictionary English the largest resource of English available on any mobile platform.